Jim Banach, barely has a limp which, given the Redondo Beach police sergeant's storied history, is a little something of a miracle. Consider: He's had a torn meniscus, a relentless staph infection, five knee surgeries and a left knee replacement. Then again, his friends don't call him "Bulldog" for nothing. "Every time you get injured, you wonder, 'Is this the one that's going to end my career?"' said Banach, 55, a police officer since 1981. "I kind of want to go out on my own terms." Indeed, his slew of injuries and surgeries - which began in 1990 when he tore his knee chasing a suspect and culminated in a left knee replacement in 2007 - hasn't slowed him down. 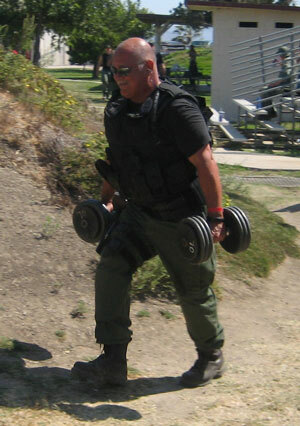 He still runs, plays tennis and golf and is in charge of the SWAT and K-9 divisions at the Redondo Beach Police Department, where he works as a communications manager in charge of 911 calls. ”If I have to do something, I'll do it," said Banach, who plans to return to street patrol later this month for the first time since his knee replacement. "The mind will make your body do what it has to do." Banach's bulldoglike exterior doesn't match his inner humility. He is the winner of two medals of honor - one for rescuing a man who fell off the Redondo Beach pier in 1992 and another for helping several people out of a burning building in 2004. When asked about these accomplishments, he simply shrugs and says, shyly: "I'd like to play that down. It's my job. Knee replacement surgery was not always a bridge back to normalcy. It used to be that getting an artificial knee would serve to alleviate pain but not necessarily get a patient back to a high-impact lifestyle. But according to Dr. Stuart Gold, director of the Orthopedic Institute in Torrance and the orthopedic surgeon who did Banach's knee replacement, technology is improving to allow for a less cautious post-surgery prognosis. For one, he said, today's replacement knees are made of a stronger material, using oxidized zirconium (branded by orthopedic supply specialist Smith & Nephew as "Oxinium"), which has in studies showed an 85 percent decrease in wear compared to cobalt chrome, the former metal of choice for knee replacements. In addition, the engineering of the artificial knee joint has improved so as to act more like a natural knee. "The bottom line is that the combination of the materials and the mechanics really help to mimic normal knee function," said Gold, who specializes in sports rehabilitation. "This allows the newer generation of knee patient to get back to a very high-impact job and be as active as he wants to be. I've got a lot of retired cops and firefighters who are golfing, surfing, skiing," Gold added. "They're out there having a good time." That's just what Banach, who has a self-proclaimed love affair with his job, needed to hear. Banach simply hasn't had good luck when it comes to his knees. 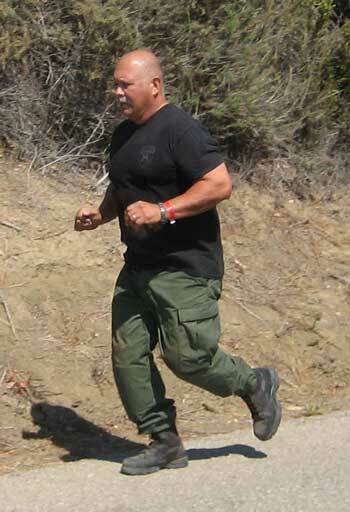 His first major injury occurred in 1990 when he tore his left meniscus chasing a suspect after a routine traffic stop. After minor surgery to repair the damage, Banach contracted a staph infection that took six months to heal. Then, a few years later, he injured his other knee when a car "ran him over" while he was riding his motorcycle." "I went over the handlebars and my right knee got stuck," he said. "I was hanging there suspended." "The doctor said I would know when it was time to get the knee replacement because I wouldn't be able to take the pain anymore," Banach said. Banach got his left knee replaced in 2007 (his right knee doesn't need it ... yet, Gold said), after which he almost lost the very job he was struggling to keep. "The city doctor (for the police department) basically told me I would have to retire, that I could not be a policeman anymore," Banach said. But Banach was determined. After he put up a fight, the doctor relented, agreeing that if Banach could pass the basic police officer recruitment test (as all officers are required to do), he could keep his job. Banach showed up early one morning along with all the twenty something police recruits to take the test. He ended up scoring in the middle of the pack. "They were all these young kids," Banach said. "To them, I was just this old guy taking the test." Of course, it took months of rehabilitation for Banach to get back to his regular activities. His regimen included daily physical therapy combined with at-home stretches and exercises designed to recover his range of motion. "It comes down to a lot of motivation and work on the part of the patient," said Gold, who suspects Banach's knee will last him 15 to 30 years before it needs to be replaced again. “Knee replacement is up there with one of the tougher recoveries," he said. "It takes daily work and hours of physical therapy and exercising to get things working properly." Banach admits he's not the model patient when it comes to how he's treating his knees, adding that he runs more than is recommended by his doctor. But the way he sees it, he has no choice. "We run after bad guys, we run to get things done," Banach said. “That's what the job is. If you can't do it, you probably shouldn't do this line of work." To learn more about Dr. Stuart Gold, please click here.